The Sameer Smile was unforgettable on the Amherst College campus 1982 – 1986 – a bright, uplifting, geniune expression that would stick with you for a long time. One day I was picking up mail after a rough morning calculus class, and there was The Smile to remind me that the day would get better. Another frantic day I’d endured some stressful final exams, and as I entered Valentine Dining Hall for lunch, The Smile reminded me that life is good. Sameer was a warm, engaging, intelligent friend, and I feel so fortunate to have known him. He was blessed, in turn, by a wonderful and loving family that caused him to smile so easily and brightly. The Sameer Smile was “Terras Irradient” in action – Sameer shining his light, happiness and comfort, on those around him, on his world. The Sameer Smile and his spirit will live on with the Class of 1986, and will continue to brighten our lives and our reunions forever. Sameer and I met Freshman year at Amherst, and was my roommate at Amherst for 3 years, sophomore through senior year, and in New York for a year after college. We also traveled a great deal together. We most recently saw each other in Chicago in January and at our 25th Amherst reunion in June 2011. I am pasting below the In Memory tribute that Ken Levin and I wrote about Sameer for Amherst College, November 2011. Ken is a friend and classmate and was a roommate of Sameer’s and mine in New York. 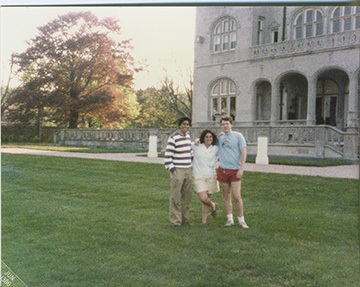 Sameer N. Shah, beloved friend and classmate, left us in a tragic accident shortly after our 25th reunion. It is a struggle to find words to properly convey the size of his life and spirit. Sameer’s wit, warmth and originality were contagious. His intelligence made tremendous success at Amherst, in his MBA program at Stanford and in his strategic and financial consulting career, appear easy. In recent years he reached new levels of happiness with his wonderful family. We instantly recognized in Sameer broad intelligence and vigorous intellectual curiosity. It was visible in his classes, conversation and astute perceptions of the world. Many of us envied Sameer’s ability to set the curve in his economics classes after only a single night of study at the end of a semester. Sameer’s education at Amherst extended his breadth as well as an already deep and proficient expertise in business and economics. He went on to McKinsey & Co., and eventually became an expert among experts, advising Wall Street firms on investment strategy. Beyond his obvious intellectual gifts, Sameer glowed in the presence of people. Wearing his signature khakis, a tailored button-down shirt and loafers, he lingered in conversation at Valentine meals, parties and the office of the Amherst Student. He drew people into his playful orbit by smiling, laughing, joking, dissecting the world and exposing irony everywhere. Sameer was a genuine friend, thoughtful, encouraging and steadfast. Sameer discovered a new depth of contentment in his marriage to Surekha and in parenting their children, Sanjana and Arjun. Even when Sameer was apart from his children, he radiated an unmistakable paternal glow. Sameer always cherished the familial love and connection he shared with his parents, Naren and Neena, and his brother, Shalin. He was bringing these same gifts into his own family. Sameer had an irrepressible love of Amherst, his friends and acquaintances, and the ideals and experiences we shared with him. In a conversation after our 25th reunion, he repeated how lucky he felt to have had this privilege. We will always remember Sameer as the brilliant, fun-loving, and gregarious rebel, the caring and devoted friend and classmate, the tender and devoted husband and father. He was an exuberant spirit that made our lives brighter. The privilege these past 29 years was ours. Is set in Friendship’s crown above. Your kindness, your grace, and your smile will remain in our hearts forever. I knew Sameer at Amherst College where we both went to school. I didn’t know him very well but I do remember him being a whiz at the subjects I didn’t do too well in (Economics, math, etc). Though I wasn’t friends with him, I always knew him as a super nice guy, very smart, very friendly, really committed to his work, always smiling. I didn’t get to know him very well at Amherst but I did see him and his beautiful family at our Amherst Reunion in May. He looked great and for those of us with young kids, I really appreciated him bringing his kids. He obviously loved his family and was a great father to them as well as being a wonderful husband. I am deeply saddened by his death mostly for his family. I hope his children realize what a wonderful man they had in their father. Sameer and I were classmates and fellow Economics majors at Amherst College. I got to know Sameer as a result of sitting in several Economics classes with him. From the start Sameer struck me as a totally engaged student, a favorite of the professorial staff, and the one student I had to keep up with and keep an eye on. I did my best to keep up grade wise but perhaps I was more successful keeping in touch post-Amherst on developments in our respective academic and professional careers. While we didn’t speak regularly, when we did speak the conversation was invariably effortless and, in our own little way, intimate. I think later in life Sameer and I shared a skeptics swagger and a willingness to look at things as they presented themselves to us and just laugh. I wish I had more time with Sameer. At our Amherst College Reunion in May we talked about getting our families together, considering the few short miles that separate us. We ran into each other a month or so prior at a Stanford/Harvard Business School bowling party and talked about spending more time together then. Our Gods didn’t permit these plans to be realized but they did bless us with a unique friendship, and for that I am deeply grateful. Amherst College…we got particularly close Sr. Year having taken many Econ classes and the class every Liberal Arts Student fears, Accounting, together. We also had a great time together Senior Week as a guest of my roommate, Liz Shoemaker, at her home in Newport…we crossed paths later in life as well and I am so happy he was at our 25th reunion with his family. There were not too many Florida kids in our Amherst Class and that gave the two of us common ground from the start. But it was not til Senior Year that I really got to know the guy behind the grin…At school, kids knew how fun loving and smart Sameer could be, but a smaller group knew him as someone who could debate almost any issue of current events or politics from any viewpoint at the spur of the moment. Sameer also had a creative side–debating teachers left and right challenging whether ir not the theories they held to really had merit. Honest truth, I figured Sameer would be our first classmate to be a Presidential advisor! He certainly had one of the great financial policy and business minds of a generation–to wit his resume will attest. I am so glad to have met his family at our Amherst reunion—it is now for old friends to tell bits and pieces of Sameer’s life to his children so they mmay grow up to be an extension of his ambition and his love. 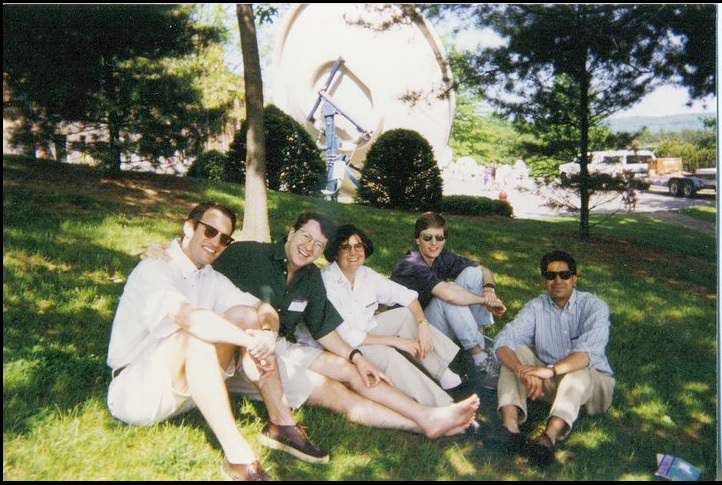 PS I attached some photos of Sameer, Mike kaufman, John Brinitzer, and Liz Shoemaker from our Senior Week Adventure in Newport and a Photo–since our class is a bit ageless, I am not sure which reunion it was from. I am the current class secretary for Sameer’s Amherst class of ’86, and wanted you to know that there has been much memory and reflection about Sameer on our class email listserv; as classmates learn about the Amherst online memory page for Sameer, they will begin to direct their postings there so you can share in them as well. Know that we are all thinking of you at this unbelievable time.